Noel Meade gained handsome compensation for the defeat of favourite Sweet Wake in yesterday’s Anglo Irish Bank Supreme Novices’ Hurdle when Nicanor lifted Wednesday’s opener, the Royal & SunAlliance Novices’ Hurdle. The 17/2 shot was partnered by Paul Carberry and came home two and a half lengths clear of 11/10 favourite Denman under a typically confident Paul Carberry ride. Meade, enjoying his second Festival success following Sausalito Bay in the Supreme Novices’ Hurdle six years ago, commented: “I’ve always loved him, he’s a gorgeous horse - this makes up for yesterday’s disappointment. Six years is a long wait for your second Festival winner! “He has lots of speed and a real change of gears but also stays well. “Paul made up his mind about which one he was going to ride last week and decided he better not change his mind later! The trainer also saddled Mr Nosie to finish fourth. He said: “Mr Nosie ran a good race and jumped really well. “It’s a brilliant feeling. I was a bit further back than I wanted to be, but Nicanor was always going so well, I was just able to take him back. “He ran well and jumped great. It was a typical ride from Paul. I’ve always thought a lot of Nicanor and he could be a Gold Cup horse one day. After the 11/10 favourite Denman lost his unbeaten record in the opening race on day two of the Cheltenham Festival, his trainer, Paul Nicholls was taking a philosophical view of the defeat. Nicholls said: “He’s run a good race, but he’s been beaten by a better horse on the day. He’s a three-mile chaser and it’s a dream to be here because when we bought him we never thought he’d be red-hot favourite for the Royal & SunAlliance. “He wants fences and he’ll be chasing in the autumn. Most jockeys agreed that that the ground was good after the first race today. Mick Fitzgerald described the surface as “good” while both Paddy Flood and Mattie Batchelor felt the ground was drying out all the time. The Royal & SunAlliance Novices’ Hurdle is a schooling ground for future champions, with Istabraq (1997) and Hardy Eustace (2003) winning the two mile, five furlong contest in the past decade, before going on to Smurfit Champion Hurdle glory. This year’s race has attracted 138 entries, with 44 from Ireland hoping to add a 13th victory for the Emerald Isle, three from France and one German representative. Paul Nicholls’ seven-strong entry includes current market leader Denman. The six-year-old gelding maintained his unbeaten record when scoring impressively in the Grade One Challow Hurdle over two miles, four and a half furlongs at Cheltenham on New Year’s Day, where he had Boychuk well held in third. Nicholls’ entry also includes last month’s Long Walk Hurdle runner-up Neptune Collonges, Natal, Gungadu, Noland and Be Be King. 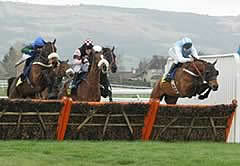 The latter completed a hat-trick over hurdles when landing a Grade Two contest at Warwick last time. Jonjo O’Neill has eight engaged and Black Jack Ketchum looks the pick of the Jackdaws Castle team. The seven-year-old is yet to taste defeat in five outings and accounted for Gungadu and Rimsky over three miles in a Grade Two contest sponsored by Brit Insurance at Cheltenham in December. That win followed a course and distance victory, where Black Jack Ketchum saw off Powerstation, Massini’s Maguire, Neptune Collonges, The Spoon Player, Circassian and Jeremy Cuddle Duck. O’Neill could also be represented by the J P McManus-owned Two Miles West, Don’t Push It, Nor’nor’east and Tempsford, as well as Briscoe Place, Manners and Refinement, who is unbeaten in four starts over hurdles. Martin Pipe matches O’Neill, with eight engaged from Pond House including recent Haydock Grade Two winner Nous Voila, Buena Vista, Magnifico and Pablo du Charmil. Nicky Henderson could run the classy four-year-old Blue Shark, while Nick Gifford has entered Straw Bear, and James Eustace has the talented but wayward Flat performer Orcadian in the mix. Ferdy Murphy’s brilliant but ill-fated French Holly won in 1998 and the trainer could saddle the promising L’Antartique while Mark Pitman and owner Malcolm Denmark will be hoping that Snakebite can emulate Monsignor who took this race in 2000 for the trainer/owner combination. Henrietta Knight could run Chelsea Bridge, last seen when defeating Trabolgan on his sole start in a Kempton bumper in February 2003, and Glasker Mill. Howard Johnson, successful last year with No Refuge, has the unbeaten Hard Act To Follow, Zeitgeist, Circassian, Turnstile and Acropolis entered. Mags Mullins saddled Travino to a neck victory over Nicanor in a Grade One at Navan over two and a half miles last month in which Mossbank was well-held in third. Noel Meade’s six-strong entry includes Nicanor, the unbeaten Mr Nosie, winner of the Future Champions Novice Hurdle at Leopardstown in December, and Too Far Back, who defeated Vic Venturi in a Navan Grade Two. The Edward O’Grady-trained O’Muircheartaigh was second to Iktitaf in the Grade One Royal Bond Hurdle in December. O’Grady won the race with Drumlargan in 1980 and Mister Donovan two years later. Zaiyad tasted success in a Grade Three hurdle over two miles and three furlongs at Enghien in December for trainer Arnaud Chaille-Chaille. Fellow French raider New Little Bric won a two mile, one and a half furlong hurdle at Pau on Christmas Day for trainer Eric Pilet. Francois Doumen could send Flat recruit Le Comte Est Bon across the Channel, while German trainer Christian Von Der Recke could run Quartier Latin, last seen when third in a novice hurdle at Catterick this month.